The PD-225 Pouch Dispenser is manufactured by GGA Packaging. 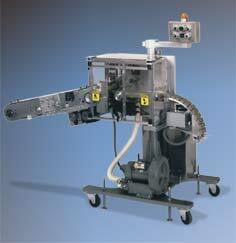 The PD-225 Pouch Dispenser is designed to deliver medium to large size pouches to other packaging operations at up to 180 pouches per minute, depending on pouch length. Advanced web-handling features eliminate physical damage to fragile pouch contents. The PD-225 accepts a fan-folded web supply from a tote or other container, which permits web splicing between containers for non-stop operation. The PD-225 can be configured for either horizontal or vertical pouch delivery. Air-operated, long-life, cut-off knives feature an anti-jamming device.